A view of the HI-SEAS habitat on the island of Hawai'i, where six crew members will spend a year in isolation. The experiment is meant to test the social and psychological effects of a real Mars mission. On Friday (Aug. 28), six scientists left the comforts of civilization, set to be gone for an entire year. Their mission will simulate what it might be like for astronauts journeying to Mars. In the confines of a 36-foot-wide (11 meters) and 20-foot-high (6 m) solar-powered dome in a remote location on the island of Hawaii, the six team members will have to live together for 365 days. They will have no face-to-face contact with humans outside of the dome. This is the fourth and longest such mission carried out by the Space Exploration Analog and Simulation (HI-SEAS) program, and its goal is to find out how people will respond to the isolation that might accompany a mission to Mars. 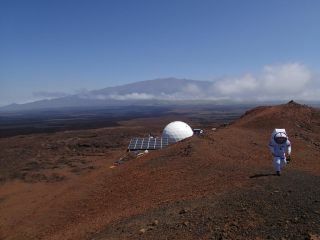 The HI-SEAS project, which is based at University of Hawaii at Manoa, has put crews into the isolated mock Mars colony in four previous missions: two 4-month missions in 2013 and 2014, respectively, and an eight-month mission that ended in June 2015. During those previous trips, the crewmembers were allowed to leave the dome in spacesuits, occasionally engaging in outdoor activities like golfing, but mostly to do research in the local environment, the way members of a real Mars crew would. The team has a yearlong supply of food and water. The cuisine, which the team must be able to store for months at a time, is similar to what astronauts eat. Team member Sheyna Gifford tweeted on Saturday (Aug. 29) a picture of a quesadilla, with some peas and corn. She wrote, "First dinner in simulated space: The cheese & turkey quesadilla & all the veggies were all dehydrated 30 min. ago." The current mission will "focus on crewmember cohesion and performance," the statement said. "HI-SEAS researchers are working to develop effective team composition and support strategies to allow crews to successfully travel to Mars and back, an estimated three-year journey." Researchers will monitor the six crewmembers throughout the mission via cameras, body-movement trackers and other methods. Back in the real world, the researchers will gather data on "a wide range of cognitive, social and emotional factors that may impact team performance," according to the statement. Crew members stand outside the HI-SEAS habitat, located in a remote location on the island of Hawai'i. In order to imitate a real Mars mission, the six crew members can only leave the habitat in space suits. The crew consists of three women and three men; four of the crew are American, one is French and one is German.As with most real spaceflight missions, the six crewmembers have a wide range of experiences and specialties, including physics, soil science, biology, medicine, robotic spaceflight, astrophysics and architecture. Gifford, who is serving as the mission's health science officer and habitat journalist, has also worked as a science journalist. Gifford has written for Astrobiology Magazine, and some of her articles have been republished here on Space.com. Gifford also has a blog called "Live from Mars" where she will write about the experience. Andrzej Stewart, chief engineering officer for the fourth HI-SEAS mission, is also keeping a blog called "Surfing with the Aliens." According to the statement, the program was awarded its third grant from NASA this past May. Those funds will be used to "keep the research project and its missions funded through 2018," the statement said.